Dr Peng Yin and Dr. William Shih, both awardees of the Common Fund NIH Director’s New Innovator Award program, have described a new method to construct complex three dimensional structures by using short synthetic DNA strands which the investigators call “DNA bricks.” In this paper, the investigators used 32-nucleotide DNA strands which self-assembled into prescribed 3D structures without scaffolds. Each DNA brick can bind up to four local neighbors, and in a manner similar to Lego® bricks can be used to build complicated structures. This self assembly has allowed the investigators to create over 100 distinct structures which can be found here. This method may have a large variety of applications such as to develop smart drug delivery particles or provide a better way for nano-scale fabrication of inorganic materials. Video 1 Animated video containing narration which describes how 3D structures of DNA bricks are assembled. Video 2 ​ Animated video which depicts the nanofabrication technique called “DNA-brick self-assembly” using short synthetic strands of DNA that work like interlocking Lego® bricks. Dr. Brian Kobilka, a grantee of the Common Fund Structural Biology program, has been awarded the Nobel Prize in Chemistry along with Dr. Robert Lefkowitz for their groundbreaking studies of G-protein coupled receptors (GPCRs). GPCRs are proteins located in cell membranes that transmit important information about the environment outside the cell, including light, smell, taste, hormone levels, and neurotransmitters. GPCRs mediate a wide range of medically-relevant biological processes, and are the target of almost half of pharmaceuticals on the market (see also “Why care about GPCRs?”). A major goal of the Structural Biology program is to determine the unique three-dimensional structure of membrane proteins such as GPCRs, in order to inform the design of therapeutics that specifically fit inside the target protein, thereby improving drug efficacy and reducing side effects. Dr. Kobilka’s Common Fund-supported research helped develop new methods for producing and stabilizing GPCRs in large enough amounts to allow scientists to precisely determine their protein structures. Dr. Kobilka and colleagues at Stanford University pioneered the use of a novel approach to protein structure determination that involved fusing a small protein called T4 lysozyme, or T4L, into a part of GPCRs that is very flexible and therefore poses challenges to structure determination. He first used this technique in collaboration with Dr. Raymond Stevens and colleagues at The Scripps Research Institute to determine the structure of the β2-adrenergic receptor (β2AR), a protein critical in cardiac and pulmonary function. The T4L fusion strategy has proven to be broadly applicable in determining the structure of a number of biologically important GPCRs involved in a wide range of diseases, including many structures discovered by researchers in the Common Fund Structural Biology program (see http://commonfund.nih.gov/structuralbiology/ for examples). Dr. Kobilka’s catalytic and transformative approach to protein structure determination is an excellent example of the nature of Common Fund supported research, which aims to accelerate biomedical research that is relevant for multiple diseases and conditions. In addition to support from the Common Fund Structural Biology program, Dr. Kobilka has also received support from the National Institute of General Medical Sciences, the National Institute of Neurological Disorders and Stroke, and the National Heart, Lung, and Blood Institute. Dr. Lefkowitz has received support from the National Heart, Lung, and Blood Institute as well. Researchers supported by the NIH Common Fund have discovered that genetic differences linked to a wide variety of diseases influence how genes are turned on, or expressed. Many genetic differences, or variants, that are associated with disease do not fall within genes themselves, but are in stretches of DNA between genes, called non-coding DNA. For many years, scientists were unsure whether or not non-coding DNA served any purpose in the cell, or what the purpose could be. It is now known that these non-coding regions have important roles in regulating gene expression, but linking genetic variation in these regions with disease risk has been challenging. Dr. John Stamatoyannopolous M.D., and colleagues, funded in part by the Common Fund’s Epigenomics program, report that the majority of genetic variants linked to risk for a number of common diseases are located in non-coding DNA regions that regulate gene expression, providing new insight into how, when, and why many diseases occur. Their findings are published in the Sept. 5 online issue of the journal Science. Dr. Stamatoyannopolous and colleagues found that some of the genetic variants linked to adult-onset diseases lie in regions of DNA that regulate genes during the early stages of development, providing a potential mechanism to explain the observation that some environmental exposures in utero or during early childhood are known to increase risk of diseases that produce symptoms years or even decades later. The researchers were also able to link genetic variants in non-coding regions with the genes they regulate, which has been a major challenge in genetic studies because the genes are often located a great distance away. In addition, researchers were able to pinpoint which cell types are affected by different diseases. These results provide new insight into disease mechanisms, and suggest novel targets for therapeutics development and disease prevention strategies. Humbert R, Maurano MT, Rynes E, Thurman RE, Haugen E, Wang H, et al. Systematic localization of common disease-associated variation in regulatory DNA. Science, 2012 Sept 5. Cancer cells need more sugar than average mammalian cells so that they can replicate rapidly to form tumors. Pyruvate kinase, an enzyme that is fundamental for converting glucose to cellular building blocks and energy, has been long studied in an attempt to understand cancer cell metabolism. In a new advance for the cancer field, a team of researchers, funded in part by the NIH Common Fund’s Molecular Libraries and Imaging program, have characterized molecules that activate a specific form of the enzyme, pyruvate kinase m2 (PKM2). It has been known that cancer cells use PKM2 instead of PKM1 because its slower activity promotes the accumulation of glucose byproducts that can be used as building blocks for new cancer cells instead of for metabolic energy. The Molecular Libraries and Imaging program supported a collaboration between the laboratory of Dr. Matthew Vander Heiden of the Koch Institute for Integrative Cancer Research at Massachusetts Institute of Technology and the NIH Chemical Genomics Center (NCGC) screening center to identify molecules that selectively activate PKM2. In a newly published study, the research team tested the molecules in mice and illustrated that the addition of the compounds interfered with the ability of cancer cells to form tumors. They then determined the structure and properties of the molecules and showed that the molecules bind to a region of the enzyme different from that bound by the natural activator of PKM2. The novel binding mechanism is critical because it allows the molecules to resist natural inactivating proteins. Thus, discovery of this mechanism may facilitate the design of experimental cancer therapeutics that effectively activate PMK2. This research is still in its early stages, but Dr. Vander Heiden’s team and others now have insightful information that may ultimately prove valuable in the fight against several types of cancers. 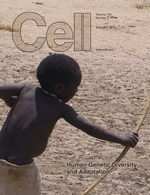 Dr. Sarah Tishkoff’s groundbreaking studies of human genetics landed her research on diverse African hunter- gatherers on the cover of Cell magazine. Dr. Tishkoff is a geneticist at the University of Pennsylvania and 2009 NIH Director’s Pioneer Award recipient. Dr. Tishkoff’s research team was able to sequence the whole genomes of five individuals in three different hunter-gatherer populations: Pygmies from Cameroon, Khoesan-speaking Hadza and Sandawe from Tanzania. They were also able to identify targets of natural selection that effect immunity, reproduction, metabolism and height in diverse hunter-gatherer populations. The research team believes continued studies will provide insight into human evolutionary history and the origin of traits that make each of us unique. Read more about the NIH Director’s Pioneer Award program…..
Opioid receptors are proteins found on the surface of cells in the nervous and digestive systems that bind opioid proteins, molecules that naturally occur in the body and play a role in regulating pain, pleasure, mood, addiction, and digestion. An array of legal and illegal drugs such as morphine, codeine, and heroin also bind to these receptors and control their activity, but usually with unwanted side effects such as hallucinations and addiction, which limits their clinical use. The development of selective therapeutics that control the activity of opioid receptors without these side effects holds great promise as pain relievers, anti-depressants, and anti-anxiety treatments. The development of such agents could have a revolutionizing effect on the treatment of acute and chronic pain, several neuropsychiatric disorders, and addiction. Dr. Raymond Stevens, partly funded by the NIH Common Fund’s Structural Biology program and the National Institute of General Medical Science’s Protein Structure Initiative, along with colleagues, has published the three-dimensional structures of two members of the human opioid receptor family- the kappa opioid receptor (KOR) and the nociceptin/orphanin FQ peptide receptor (NOP). As reported in the May 17, 2012 issue of Nature, these structures reveal unprecedented detail about the shape of these receptors, which may allow researchers to design drugs that can interact with these receptors in specific ways to elicit only the desired effects. KOR is the only receptor that binds the active ingredient in the plant Salvia divinorum (also known as “Salvia” or “Magic Mint”), which has recently gained popularity as a recreational drug of abuse causing hallucinations and psychedelic experiences (see the National Institute of Drug Abuse InfoFacts: Salvia). The part of the receptors where drugs and other molecules bind, called the binding pocket, is very large in both KOR and NOP. KOR and NOP differ in only a few specific places within the binding pocket, but these differences result in significant changes in the shape of the pocket, explaining why some molecules specifically bind to one receptor, but not the other. In the same issue of Nature, Dr. Brian Kobilka and colleagues published the structures of the mu and delta opioid receptors; collectively, these four papers reveal the structures of the entire family of human opioid receptors. Drs. Stevens and Kobilka used sophisticated techniques, developed in part through previous Common Fund support, to create the protein crystals needed to reveal the underlying protein structure. These studies provide a major clue in understanding the selectivity of opioid receptors, opening up new avenues of research into basic research about brain function and consciousness, as well as the development of clinically useful therapeutics. Read the university news release…. Wu H, Wacker D, Katritch V, Mileni M, Han GW, Vardy E, Liu W, Thompson AA, Huang XP, Carroll FI, Mascarella SW, Westkaemper RB, Mosier PD, Roth BL, Cherezov V, Stevens RC. Structure of the human kappa opioid receptor in complex with JDTic. Nature, 2012 Mar 21 (online publication date); 485(7398): 327-32. PMID: 22437504. Thompson AA, Liu W, Chun E, Katritch V, Wu H, Vardy E, Huang X-P, Trapella C, Guerrini R, Calo G, Roth BL, Cherezov V, Stevens RC. Structure of the nociceptin/orphanin FQ receptor in complex with a peptide mimetic. Nature, 2012 May 16; 485(7398):395-9. PMID: 22596163. Manglik A, Kruse AC, Kobilka TS, Thian FS, Mathiesen JM, Sunahara RK, Pardo L, Weis WI, Kobilka BK, Granier S. Crystal structure of the mu-opioid receptor bound to a morphinan antagonist. Nature, 2012 Mar 21 (online publication date); 485(7398): 321-6. PMID: 22437502. Granier S, Manglik A, Kruse AC, Kobilka TS, Thian FS, Weis WI, Kobilka B. Structure of the delta-opioid receptor bound to naltrindole. Nature, 2012 May 16; 485(7398): 400-4. PMID: 22596164. Temptation and self-regulation are issues that everyone experiences. However, a new research study funded in part by the NIH Common Fund’s Science of Behavior Change Program has now examined, in detail, delayed gratification responses in a group of subjects over the course of four decades. In their current study, the researchers selected a group of subjects now in their mid forties who were previously tested for delay-of- gratification responses in preschool. Their main objective was to examine the neural basis of self-regulation. In the ~60 subjects tested, the researchers found that those who performed poorly as preschoolers also showed similar performance levels throughout their 20s, 30s, and now 40s. The researchers showed that these “low delaying” participants performed more poorly than high delayers when having to suppress a response to a happy face but not to neutral or fearful faces, suggesting that sensitivity to specific types of cues plays an important role in one’s ability to suppress actions. The results show that impulse control is difficult only when the tested cue is alluring to the subject, highlighting that the behavioral response is specific to compelling cues. The study then went on to examine a smaller subset of the participants using functional imaging, something that had not been conducted on any of the subjects previously. Examining both high and low delayers using alluring cues, the authors showed consistent differences in brain circuitry responses. The findings of this study show that the delay-of-gratification test serves as a good method for examining motivational and control processes, which appear to be stable from preschool through adulthood. Casey BJ, Somerville LH, Gotlib IH, Ayduk O, Franklin NT, Askren MK, Jonides J, Berman MG, Wilson NL, Teslovich T, Glover G, Zayas V, Mischel W, Shoda Y. Behavioral and neural correlates of delay of gratification 40 years later. Proc Natl Acad Sci U S A. 2011 Sep 6; 108(36): 14998-5003. PMID: 21876169. Researchers supported by the NIH Common Fund and the National Institute of General Medical Sciences teamed up to characterize an important G Protein-coupled receptor (GPCR). GPCRs are a class of membrane proteins involved in an array of physiological functions and human diseases, including multiple sclerosis. Importantly, these receptor proteins are the target of approximately 40% of all medications currently on the market. Using technology developed in part through support from the Common Fund’s Structural Biology Program, the research teams of Drs. Raymond Stevens and Hugh Rosen at The Scripps Research Institute teamed up to examine the GPCR sphingosine 1-phosphate 1 (S1P1) bound to different activators and inhibitors developed through the Common Fund’s Molecular Libraries and Imaging Program. S1P1 receptors play critical roles in controlling multiple sclerosis and other diseases, making the discovery useful for advancing treatment options. Advances made in this study allowed the researchers to identify how molecules bind in different ways to the receptor and better understand at a detailed level how access to the binding pocket is gained. These advances pave the way for more targeted drug design that will yield highly effective therapeutics with fewer side effects than current treatments. These findings were published in the February 17, 2012 issue of the journal Science. Hanson MA, Roth CB, Jo E, Griffith MT, Scott FL, Reinhart G, Desale H, Clemons B, Cahalan SM, Schuerer SC, Sanna MG, Han GW, Kuhn P, Rosen H, Stevens RC. Crystal structure of lipid G protein-coupled receptor. Science, 2012 Feb 17; 335(6070): 851-5. PMID: 22344443.